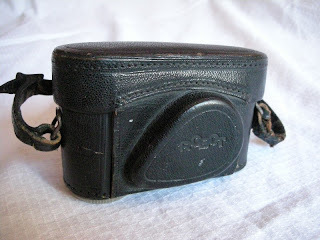 Around 1930 Heinz Kilfitt, a trained watchmaker, designed a new 35 mm film compact camera using a 24x24 mm frame format (instead of the Leica 24x36 mm or cine 18x24 mm formats). The 24x24mm square frame provided many advantages including allowing for over 50 exposures per standard roll of Leica film instead of 36. 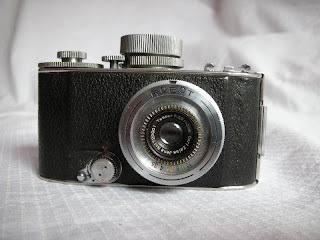 Kodak and Agfa rejected the design and it was sold to Hans Berning who set up the Otto Berning firm. Otto Berning got its first Robot patent in 1934. This omitted the spring motor drive as it was originally intended to come in two versions: Robot I, without motor, and Robot II with a spring motor. Its release was delayed and already the first camera "Robot I" included its hallmark spring motor. The first production cameras had a spring drive that could turn at a sensational 4 frames per second. The body of the Robot 1 is Stainless steel. Kilfitt designed a rotary shutter with speeds from 1 to 1/500th second. 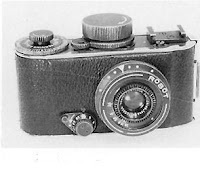 The camera used proprietary "Type K" cartridges, not the standard 35 mm cartridges—introduced in the same year by Kodak's Dr. August Nagel Kamerawerk for the Retina—available today. The camera has no rangefinder. 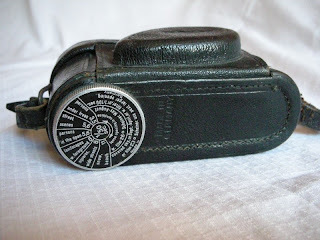 Its does not need one: it was designed for use mostly with short focal length lenses (e.g. 40 mm). With practice a photographer could take 4 or 5 pictures a second, in the Olympic Games from Berlin in 1936, Robot I did an excellent job of sequence photography. This knob with the word Germany is not usual. Robot manufactured only 30.000 units from 1934 until 1938. Its hard to find today a Robot I in good conditions. Robot I without view Finder from an antique brochure. The Robot is often viewed a degree of wonder. Whilist everybody agrees that is a good camera, it also a model that does not fit into the usual range of instruments. Yes, it is precision built,it is fited with good lenses of well know reputation, it is a small, well made camera, but it has features to which a conventional photographer is not accustomed, which he cannot place and with which he has no experience. In consequence he just wonders.